1997-2002 Ford Expedition 2WD Air To Coil Spring Conversion Kit With Rear Shocks is the perfect solution to your air suspension problems. Designed to be very affordable, you can convert your air suspension to use standard shocks/struts and coil springs for less than the price of replacing one air strut. 1997-2002 Ford Expedition Rear Air Suspension Conversion Kit With 2 Rear Shocks 2WD FY1RB is the perfect solution to your air suspension problems. Designed to be very affordable, you can convert your air suspension to use standard. The original air suspension system on the 97-02 Ford Expedition is made up of assorted parts that must always function in sync. If one part is not working, the system will need repair. Multiple trips to the Ford dealership gets expensive for the Expedition driver. As The Suspension Experts, we knew there had to be a more affordable alternative to direct replacement at the dealer. Without sacrificing quality, we created this air to non-air suspension conversion kit for the Ford Expedition. This kit, manufactured in America, includes two rear Eibach springs and two rear shocks. Our customers will attest that the kit saves them time, money, and frustration. With the guidance of detailed instructions and installation videos that are available to view, the kit can be installed with ease. Strutmasters provides excellent customer service- call or chat with our ASE certified technicians at any time. Carefully review the price difference between choosing an air vs. non-air suspension system. 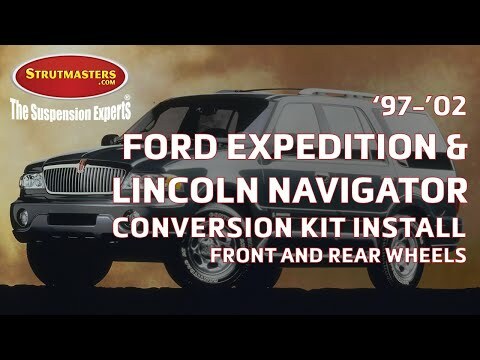 We compare three prices: that of repairing the failed air suspension system at the Ford dealer, that of installing aftermarket air suspension parts on the Expedition piece-by-piece, and that of installing a brand new Strutmasters rear suspension conversion kit. The money you will save with the Strutmasters kit is considerable. Proper diagnosis of a failed or leaking air suspension system is key in order to avoid total failure of the 1997-2002 Ford Expedition. Look for these common signs that the air suspension system is going bad, before it‚Äôs too late. The most noticeable sign that the air suspension system is failing is a major difference in ride height from the front to the rear end of the Expedition. Typically, with this model, the rear suspension fails first causing that end to sag. The front end will likely remain inflated. This gives the illusion that the Expedition is ‚Äúsquatting‚Äù down in an unusual fashion. One obvious sign of suspension failure is an illuminated suspension warning light on the interior instrument cluster. The condition of the air compressor can indicate a suspension problem, as well. If it has stopped working or is running too long (longer than 15-20 seconds at a time), then a suspension repair or replacement is likely needed. Any visible cracks in the rear air springs (caused by dry rot) further prove the suspension has gone bad. = TOTAL: Over $2,820 (and that doesn√¢¬Ä¬ôt even include replacing electronic components that are known to fail such as the height sensors). 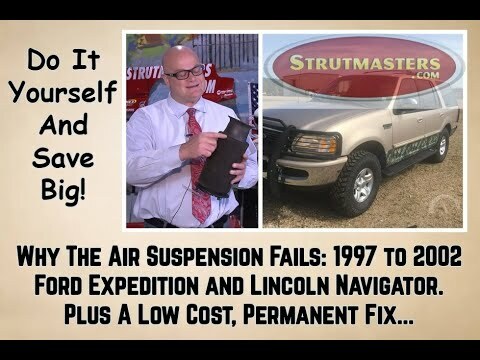 Thought I was stuck with replacing air bags when I heard of the Strutmasters conversion. Checked online and watched the video, but decided to have a local repair shop do the installation. Very happy with the results (and cost). Raised the back end of my ’99 Expedition by 7″ over the ‘blown’ bags. On the drive today, it handled like a ‘new’ car, but has 237K on it. Guess I’ll keep it for another 100K. “I have a 1998 Linc Navigator and last weekend the rear air shocks failed. 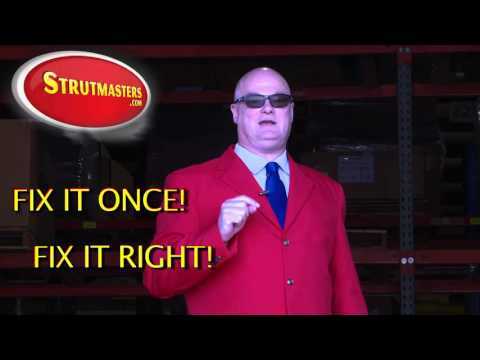 I remembered seeing Strutmasters on Trucking U so I looked them up and ordered rear coil overs and new shocks. They arrived in 2 days and after work in 2 nights I had them in. My SUV drives great and you saved me a fortune vs the dealer. Thanks to the great instructions and video clips of the installations. I felt comfortable before I started that I could do it my self. Now for the front shocks! I dealth with Mike who was most professional and knowlegable. My 2001 Lincoln Navigator was leaning hard to the left with a blown air bag. Mike suggested the Coils Spring/Rear Shock replacement. The car now rides like a dream and I am forever out of worries about the air system breaking again! Thanks Mike! I want to Thank You All for the way you do business. From the moment I called the first time, everybody was very polite and helpful, especially Jason. He answered all my questions no matter how many times I called. He was there for me until you shipped my parts. I had a little problem once I got my kit, I could not find any body that would install them for me because the kit was not from them and the ones I did find said it would take any where from 4-5 hours. A manager from an auto part store gave us the name of California Smog and Repairs (Suspensions) at 10711 Beach Bl., Stanton, CA 90680 (714-995-7591). Gave them a call and they said they could install them in 2 hours. The going rate for labor here in Orange County is $85.00 per hour. I gave them the coupon on the last page of the instruction book that came with my kit. If any body order your kits from California you now have a contact here that will help us poor people. I found you because Air Lift wouldn’t sell to me because I’m not a company and then when I went through Camping World, they didn’t have the parts for 2 wheel drive. I wrote to my friends on FACEBOOK about how much money ($1200.00) I saved with you guys coming to my rescue. Thank You…JASON. “My husband has already place the parts on the car. I must say the car ride very well, and the gas mil-age is so much better. Thank you so much for the excellent part. I will be returning to this website for more parts. Just wanna say thanks to Strutmasters for everything! Others places were charging up to $1000 to fix our faulty suspension on our Ford Expedition! So glad i found this website! No more bumpy rides… EVER! Now our Expedition rides silky smooth thanks to the new spring coils and shocks! I now have a website i can refer to other people going through the same problem. Strutmasters, you are a life saver! On a positive note, the product is everything you promised. The X (what we call it) is standing up and rides good. Took about (2) hours to accomplish and I’m satisfied with your product. The light (mentioned above) is just annoying. I would include the website address to watch the video in your instruction manual. Sometimes it’s easier to see it done (at least for me). That’s about all I have for you. I would recommend your product to anyone having a similar problem. “I have not worked on a car in over 20 years. I was able to replace the rear air suspension in under 2 hours. This kit is as easy as advertised. Thanks Strutmasters. quality being terrible after the conversion.